Like the UK, a number of countries in Europe are also tackling the challenges of reducing public deficit and employing public resources more effectively. In Italy new leglislation was introduced earlier this year to reform the labour market structure. It has also brought about a new system of unemployment benefits. This blog gives an overview of the Italian welfare system, comparing it to UK, and discusses the changes to the welfare system that have been introduced by the new Jobs Act. We look at who, in Italian society, is better off as a result and who remains unsupported. 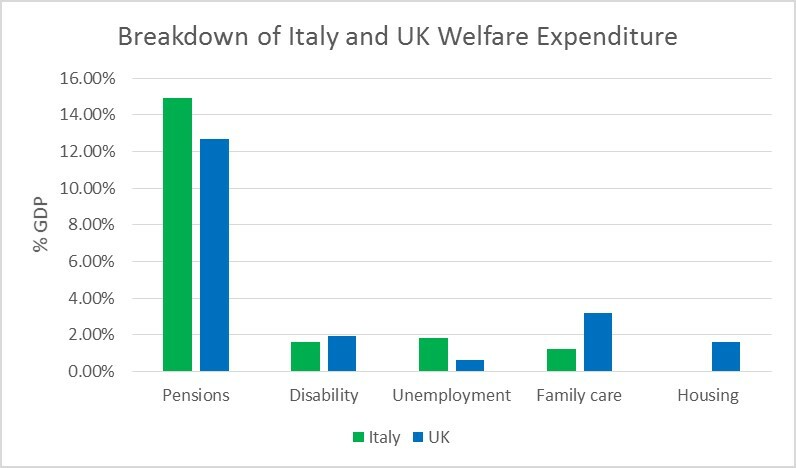 The Italian welfare bill is the fourth largest in Europe, directly following the UK, and it accounts for approximately 30% of the country’s GDP. As in the UK, pensions constitute the biggest source of welfare expenditure (1). The table above highlights how the percentage of social expenditure spent on family care and housing in Italy is considerably lower than in the UK and, more widely, than the Western Europe average. The most striking difference between the two countries is the housing sector. In both Italy and the UK, housing support is provided and administrated by local authorities and non-for-profit housing associations and cooperatives. Yet according to Eurostat, Italy spent an average of £6.07 per inhabitant on social housing in 2013 compared to £384.06 spent by British authorities. The Italian system of unemployment benefits is a rather complex one due to the differences in eligibility requirements and duration of treatments. The main peculiarity is the absence of a general non-contributory minimum income scheme for non-disabled people such as the UK’s Jobseeker’s Allowance. With the exception of an income support scheme for people over 65 (known as Assegno Sociale, basically a social pension scheme), all other types of unemployment benefits are attributed on a contributory basis. Two main unemployment insurance schemes exist in Italy, the CIG and ASPI. The Cassa Integrazione Guadagni (CIG) is a state fund run by the National Social Security Institute (INPS) – the Italian equivalent of the UK’s Department for Work and Pensions (DWP). The fund integrates salaries of workers in cases of suspension or temporary reduction of activity due to causes beyond the will of the enterprise or the workers. It is important to clarify that workers entitled to CIG have not yet entered unemployment. Due to the high legal protection against dismissal they remain employed by their companies which, in agreement with government officials and trade unions, are able to draw from the national fund in circumstances of suspension or reduction of the activity. This mechanism guarantees workers with up to 80% of their previous salaries for a maximum of 24 months in case of restructuring of the company, and of 1 year in case of market crisis and bankruptcy. The amount and duration of the out-of-work coverage varies by sector due to different negotiations between trade unions, government and employer’s representatives. Workers in sectors with a stronger trade union presence, such as manufacturing, enjoy greater safeguards than employees who work in the tertiary sector or in small enterprises. 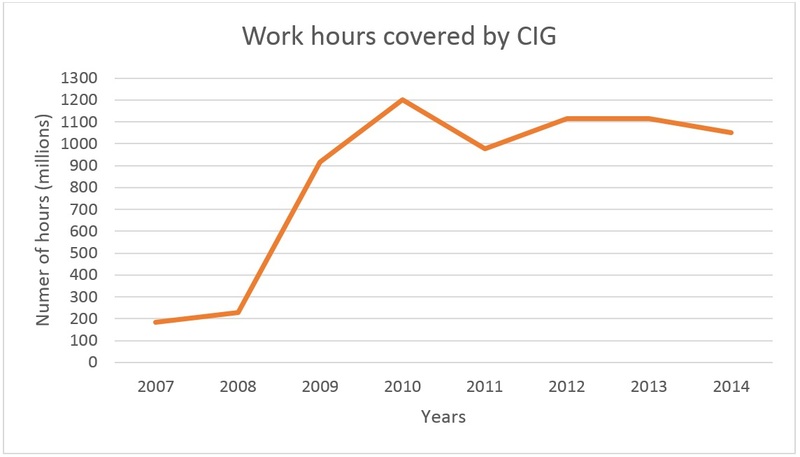 The prolonged phase of economic downturn in the last few years was reflected in a steep increase in the number of hours covered by the CIG, as illustrated by the graph below. Who gets public unemployment support? The second instrument of unemployment insurance is the Social Insurance Provision for Employment (ASPI). Those who are entitled to this benefit are workers with permanent contracts who have paid their national insurance for at least two years. ASPI claimants are entitled to 75% of their in work salary up to €1,165 per month and to the 25% of each extra Euro above this sum if their salary exceeded this threshold. This protection can last for 10 months for people under 50 and 12 months for those who are older. Workers with fixed contracts are entitled to a shorter type of unemployment benefit, the mini-ASPI. For these people to qualify, 13 weeks of national insurance payments is required. The duration of the coverage is equal to half of number of weeks worked in the previous year. Categories of self-employed and freelancer are not entitled to any public unemployment scheme. The Jobs Act was adopted by the current parliament in December 2014 to change the structure of the labour market in Italy. The Jobs Act marked a move away from the discriminatory approach of the previous unemployment insurance system with the introduction of a more harmonized scheme for out of work support. The legislation regulates the use of CIG as an instrument of last resort. Now companies must be unable to manage the crisis by implementing other solutions, such as reductions in hours worked or usage of holiday days. In addition, CIG will not now be available to companies that are winding down. At the same time, the new legislation will open this benefit to firms operating in a wider list of industry sectors. As a counterweight for the weakening of protections against dismissal, the Jobs Act introduced a more comprehensive and harmonized unemployment benefit, the New Social Insurance Provision for Employment (NASPI). Those who are entitled to this claim are workers who have lost their jobs and who have paid their national insurance for at least 13 weeks in the previous 4 years or 30 days in the last 12 months. Receivers of NASPI are entitled to 75% of their average salary of the previous 4 years, up to a maximum of €1,195 per month. As an incentive for people to seek employment, the NASPI payment will decrease by 3% every month after the fourth month. The NASPI can be claimed for half the number of months the claimant has paid her national insurance for, up to a maximum of 2 years. Much like the UK’s new Universal Credit, entitlement to NASPI is conditional on claimants’ active attempts to seek employment and to their participation in programmes of professional training. The application for NASPI is online only and the benefit is paid monthly, directly on the claimant’s bank account. an experimental means-tested income support for workers who no longer entitled to NASPI, have children, or are close to retirement age. This benefit will be equal to 75% of the last NASPI payment and available for a maximum of six months. These reforms reflect the attempt by the Italian government to move away from the discriminatory approach of current unemployment benefit schemes. More support is now available to a wider range of workers while incentives for employers and workers to overcome structural unemployment have been introduced. Yet large groups of people in Italy still remain unprotected, with individuals of young age among the most vulnerable. Indeed, in a context with unemployment rates close to 45% among young people , the contributory requirements of all types of out-of-work schemes still leave large sections of Italy’s youth out of the sphere of public support. I’m a Italian citizen born abroad, currently living in the US. I’m planing to move to Italy in the summer. Is there any social assistance that I can apply for until a settle down and get a job there? We mainly focus on the UK welfare system here at Policy in Practice, so I can’t give you much advice on this. However, you may be able to find out more by contacting the local council of the place you are moving to in Italy. If you have any other questions please post here.